an occasion to consider campaigns to promote the social, scientific, creative and economic benefits of the museum domain to the community. 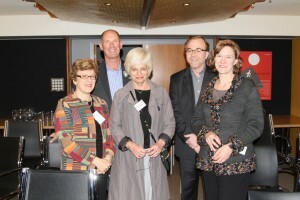 Margaret Anderson (Director, History SA), Anthony Wright (Director, Canterbury Museum), Mary-Louise Williams (former Director, Australian National Maritime Museum), Pierre Arpin (Director, Museum and Art Gallery of the Northern Territory) and Linda Ferguson (Assistant Director, Public Programs, Australian War Memorial) at the 2011 conference at the Canterbury Museum in Christchurch. Meetings are held at least twice a year at each member museum in rotation. Every second year CAMD undertakes to hold one meeting at the site of a New Zealand member’s institution. The CAMD General Meeting is held in March/April each year. The CAMD Annual General Meeting is held in September/October each year. Between general meetings, CAMD’s Executive meets to manage the more immediate business of the Council. The dates of forthcoming meetings will be publicised as news items on this site.